In 1977 the superior producer was on its way to Isla Margarita, when it came into the harbor of Curacao to take on fuel and supplies. As the ship continued its voyage it ran into trouble when it exited the harbor. Due to rough seas, part of the cargo shifted and as a result the ship listed and started to take on water. 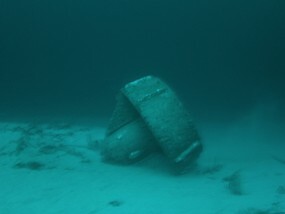 The ship was towed to the north of the harbor entrance where it finally sunk just of the coast of Otrobanda. At a max depth of 32 mtr (106ft) One of the best spots of Curacao. We do a lot of the Tec Side mount course dives there. Great to practice all the skills. We also make long Tec dives on it up to 90 min bottom time, and deco stops up to 30 min. So a great spot for Tec/Rebreather divers. Make the deco stops on a great reef, full off fish. Or why not turn it into a drift dive? Just follow the reef in to the double reef. And end your dive at goby divers. Rinse your gear. And make some new Dive planes here. At the max depth of 75 mtr (248 ft.). An amazing site full of construction stuff, cars and many more. This is a site for Tec/Trimix and Rebreather divers. Great to spend a long time there and try to explore it all. We even spotted some stuff on a depth of 125 mtr (413 Ft.). So do you have what it takes to go down there?? During your deco stops plenty to see and explore on an amazing reef. Easy access from shore. But also a great boat dive. Located on the reef around Curacao Sea Aquarium. Two tugboats they made a nice trip down during a storm. Lucky for us they stopped just before the shoulder off the reef. On a max depth of 50 mtr (165 ft.). On a sandy plateau. So great to explore. But even we don’t know what’s there in de deep. So let’s go and explore a bit more. This is a Tec/Trimix and Rebreather dive. We do a lot of the Tec 50 course dives there. During the deco stops, there is plenty to see on the healthy reef. This is a perfect boat dive spot. You can end a deco stops as a drift. Flying over the reef. Located on the reef in front of Kokomo beach. At the max of 60 mtr (198 ft.). A great site to explore. You will find a Tug boat and some old cars, a bit further a pontoon (barge). You will be back in the old days, great old models some still standing strong. Perfect spot for multi-level Tec diving. A great spot for Tec divers, beginning Trimix divers and Rebreather divers. We love to spend a long time there exploring. Deco time is reef time. Never get sleepy, always some stuff to see. Also one off the Tec 50 course dive spots. Easy getting in from shore. But also a great boat dive. Located on the house reef off: All in one Watersports and shop. Up to a depth of 140 mtr (462 ft.) and more. It’s a great reef/wall dive.This is an excellent site for experienced Tec/Trimix divers. But also great for Rebreather divers. Even we don’t know the max depth there. So let’s go and explore with us. During you’re Deco stops plenty to see on a healthy reef. Easy entering from shore. And also a great boat dive. And also an excellent drift dive location. Located on the house reef off: Wederfoort dive shop. Up to a depth of 95 mtr (314 ft.) and more. It’s a great reef/wall dive.This is an excellent site for experienced Tec/Trimix divers. But also great for Rebreather divers. lets look on what they dropped by mistake. During you’re Deco stops plenty to see on a different reef. Easy entering from shore. And also a great boat dive. And also an excellent drift dive location.